The three-piece set from Copper Chef includes an 8-inch frying pan, a 10-inch frying pan, and a 12-inch frying pan. It ensures you’ll always have the right size whether you’re cooking eggs for two or pancakes for the family. The pans are made from aluminum, so they’re very lightweight and easy to handle. They have a proprietary cerami-tech outer coating while the interior has a copper-colored nonstick ceramic coating. A stainless steel bottom plate means the pans heat evenly and can be used on induction cooktops. The handles are riveted on for security. These pans should be seasoned before use, but are dishwasher safe for easy cleaning. The pans are heatproof to 850 F, so you can use them in the oven as well as on the stove. The BulbHead Red Copper Square Pan comes with extras that make it even more useful: a vented and tempered glass lid, a fry basket, and a steamer/roaster rack. The 4-inch high sides help reduce splattering and let you use it to cook sauces or when deep frying. The interior is a copper-infused ceramic that is nonstick, scratch-resistant, and oven safe to 500 F, so you can use it in the oven and under the broiler. A helper handle makes it easy to move and empty the pan, even when it’s full. The pan should be seasoned before using. While it is dishwasher safe, hand washing is recommended. Made from stainless steel with a blush-copper colored exterior, this Cuisanart product is a quality cookware set without the super-high price tag that often comes with copper. The cool-grip handles are contoured for comfort and perfect balance and they are riveted on for security. The glass lids fit snugly to keep moisture in during cooking. The pots are oven safe to 400 F, while the lids are oven safe to 350 F. All pieces are dishwasher safe for easy cleaning. The pots can be used on any cooking surface, including induction. The set should easily cover all your kitchen needs. It includes a 1 1/2-quart saucepan, a 2 1/2-quart saucepan, a 3-quart saucepan, an 8-quart saucepan, an 8-inch skillet, and a 10-inch skillet. All of the saucepans include lids and you'll also get a steamer insert. Traditional jam pots are made from copper, like this 11-quart unlined copper pan. The copper conducts heat efficiently and doesn’t react with fruits or sugar. It’s perfect for making large batches of fruits and jellies, as well as candy. Made by Mauviel in France, the company has been making quality copper cookware for 170 years. This pan has bronze side handles with copper rivets. Hand washing is recommended to ensure it gives you years of delicious jams. Copper cookware is stylish, but hammered copper cookware takes it to a whole new level, with an artisan look that is distinctive and classy. Lagostina has a wonderful hammered cookware set that is sure to look great in your kitchen. The cookware has a thick aluminum core for efficient heat distribution and a stainless steel interior. The lids are also stainless steel. Besides being beautiful, the hammered copper exterior offers excellent heat control, while the handles are designed to be comfortable to hold while they stay cool on the stove. The cookware is oven and broiler safe to 500 F. It is compatible with all stove types, except induction. Sometimes, all you need is a simple saucepan. 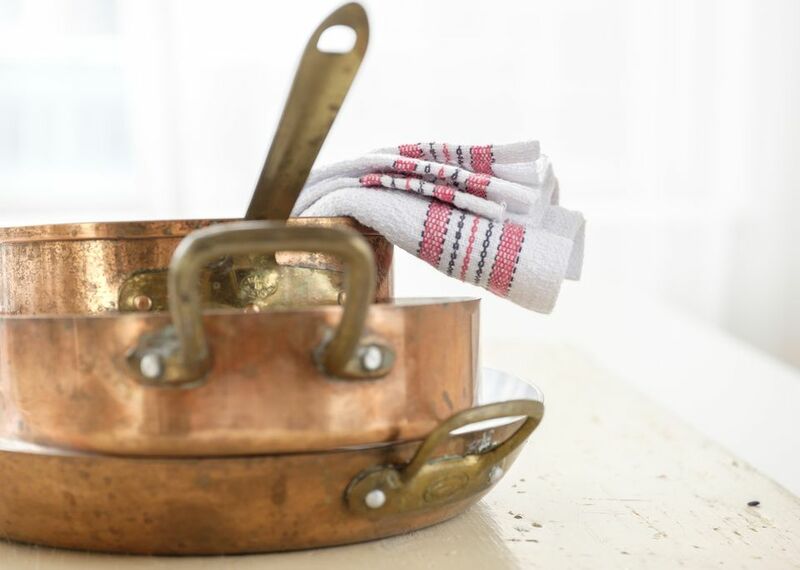 Old Dutch Copper has a 2-quart covered saucepan that will be a beautiful addition to any kitchen. It will also become one of the most useful pieces you’ll own. The pot has a stainless steel interior, a copper exterior, and an aluminum core for the best combination of durability, performance, and beauty. The stainless steel base means that this can be used on any cooking surface, including induction. You’ll use this pot for everything from pasta and sauces to hearty stews. Measurements are etched into the inside of the pot, so it’s easy to add just the right amount of liquid and monitor sauces as they reduce. The flared rim allows drip-free pouring. The pot and lid are oven-safe to 500 F; the pot can be used under the broiler without the lid. The handle is designed for comfort and is riveted on for security, and it has a hanging hole so you can display it on your pot rack or wall. A tempered glass lid is included. This product should be hand washed. This is the type of pan used by pastry chefs for sugar work, zabaglione, and more. The Demmex Hammered Copper Pan is great for home cooks who want to try their hand at candy making. It’s also perfect for small batches of jams and jellies. The pan is made from solid copper with a hammered exterior. The interior is unlined. Both the long handle and the helper handle are made from brass and are riveted for security. The pot holds 1.7 quarts and is 1.2mm thick. This one should also be hand washed.